Emergency exit lights run on 110 volt current. The equipment also has battery backup power supplies so that, in the event of a 110 volt power outage, the exit lights and emergency lights will continue to light the way so people will be able to exit the building. Chapter 7 of NFPA 101, Life Safety Code (National Fire Protection Code) states that functional tests must be conducted annually for a minimum of 1½ hours (the emergency lighting equipment must be fully operational for the duration of the test). The purpose of this annual test is to ensure that the backup battery power supplies are in good condition and will light the way for a full 1½ hours. Manufacturers of the batteries have stated, that depending upon original battery shelf life and actual on-site installation conditions, the life span of the batteries may be as little as 2 to 3 years. So this annual test has a purpose...to verify if the batteries have reached their life span or not. Building owners take note: a worse case scenario might be a night time building fire with 110 volt power loss. Smoke from the fire is compounding the problem by restricting the ability to find one's way out. The backup batteries have not been serviced annually and fail to light the way out. A fire victim dies. In addition to the reality of possibly being responsible for the victim's death, both civil and criminal lawsuits could result. Not a pretty scenario. Have your Emergency Exit and Lighting equipment serviced annually. 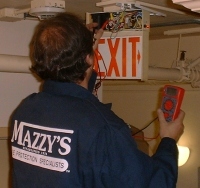 Mazzy’s Fire Protection Specialists Inc.
Contra Costa County, The East Bay, The Peninsula, Santa Clara County and San Francisco. © 2017 Mazzy's Fire Protection Specialists Inc.